The abdomen is blood red and is considerably waisted at segment 4 and clubbed towards the tip. Bold black mid dorsal stripes are present on segments 8-9 and there are black markings along the abdomen sides. The thorax is red brown with no antehumeral stripes, but a black T shape on the top. The frons is red with a black line extending some distance down the sides. The eyes are red brown above and greenish below. The legs are completely black. The wings have red brown pterostigma and are clear apart from a small area of saffron at the base. The wings may become suffused yellow with age. Immature males are yellow. The abdomen and thorax are yellow-ochre with a fine mid dorsal black line running down the length of the abdomen, becoming much thicker at segments 8-9. On the thorax sides are 2 narrow black stripes and on top of the thorax a black T shape can clearly be seen as in the male. The eyes are red brown above and yellow below. A black line extends some way down the side of the yellow frons. The legs are entirely black. 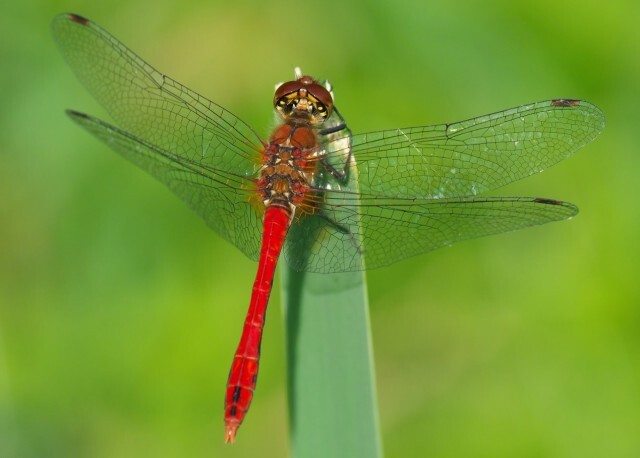 Common Darter is the species most likely to be confused with Ruddy Darter. 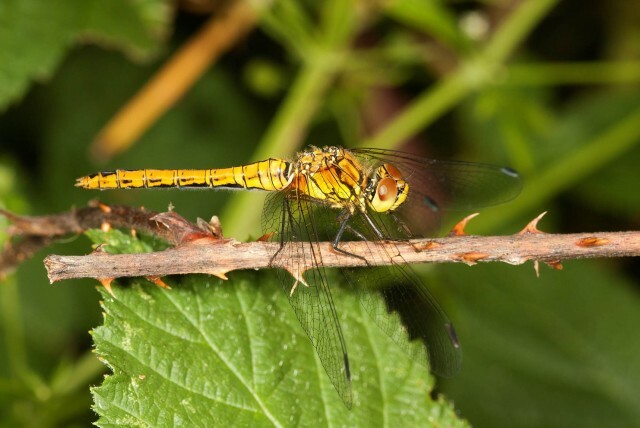 The Common Darter lacks the noticeably waisted abdomen and is more red-orange in colour. The Common Darter also has a visible light stripe extending down the black legs and has antehumeral stripes present on the thorax. In addition the Common Darter lacks the distinct black line extending down the side of the frons. Black Darter have completely black legs like Ruddy Darter but can be distinguished by the black triangle on top of the thorax and the yellow 3 spot pattern on the thorax side. 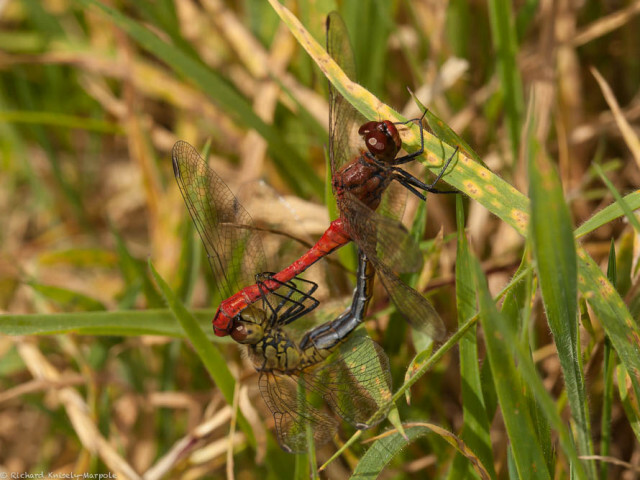 Males establish territories but are not as aggressive as other darters. They select a prominent perch a short distance from the water and from here launch attacks against intruding males or fly out to catch insects. They will also settle on bare ground or stones to take advantage of reflected heat. When females arrive at the water they are grabbed by a male and held in tandem before retreating to perch amongst vegetation where copulation takes place. The pair then fly off in tandem to select an oviposition site, usually where there is submerged aquatic vegetation though sometimes over damp mud. The male then lowers the female and swings her to release the eggs. Occasionally females will also oviposit alone. Frequents well vegetated shallow ponds, lakes, ditches and canals usually with woodland close by. The earliest record was made in 1980 at Whixall Moss. This was followed by a handful of records in the 1980’s made at the privately owned sites; Berrington Farm Pool, Berrington Pool and Shomere. In addition a number of sightings were made at Dudmaston. During the 1990’s the number and location of sightings increased including Granville Country Park, Chelmarsh Reservoir and Brown Moss. Described as scarce by Lockton et al., (1996) this species is now local with the current distribution map showing an increase in distribution. This is largely in the central, northern and eastern areas of the county though a number of records have been made in the south west which is comparatively less well recorded. 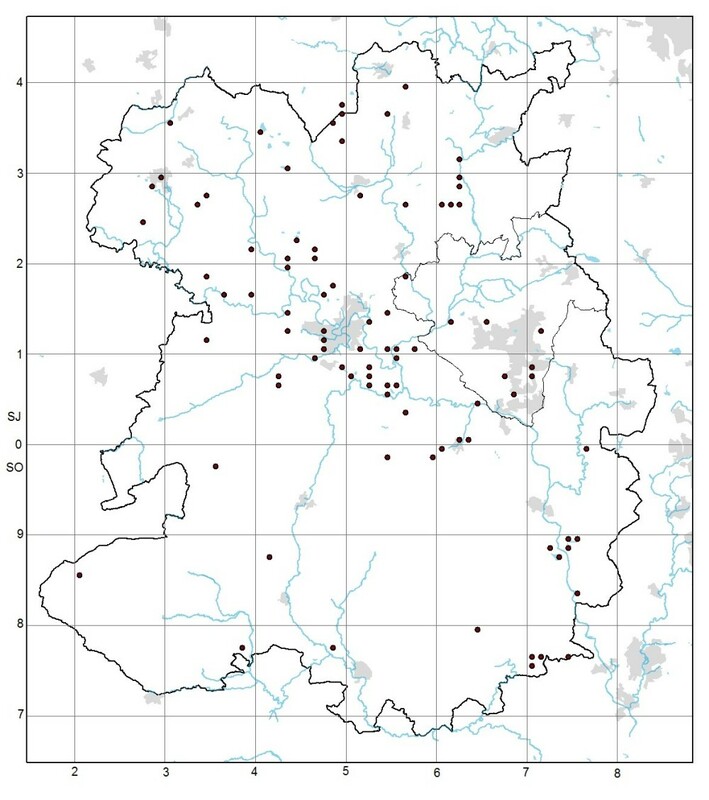 The recent National Atlas (Cham et al., 2014) showed a slight increase in distribution expanding northwards and recently some interesting records were made in Shropshire such as the first ever record at Cramer Gutter, Catherton Common. Dudmaston, Venus Pool, Dolgoch Quarry, Whixall Moss. Limited access may be possible to Berrington Pool, but please contact us via the contact form to arrange this. Follow this link for a national distribution map of this species.